The International style was a major architectural style of the 1920s and 1930s. The term usually refers to the buildings and architects of the formative decades of Modernism, before World War II. These building largely consist of concrete, glass and steel and are sometimes derogatively called glass boxes. 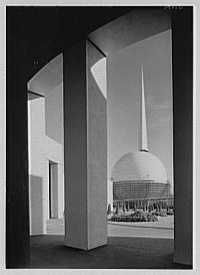 The term had its origin from the name of a book by Henry-Russell Hitchcock and Philip Johnson written to record the International Exhibition of Modern Architecture held at the Museum of Modern Art in New York City in 1932 which identified, categorised and expanded upon characteristics common to Modernism across the world. Royal Corinthian Yacht Club (1931), by Joseph Emberton. Labworth Café (1932-33), by Ove Arup. Unless indicated otherwise, the text in this article is either based on Wikipedia article "International Style (architecture)" or another language Wikipedia page thereof used under the terms of the GNU Free Documentation License; or on original research by Jahsonic and friends. See Art and Popular Culture's copyright notice. This page was last modified 00:15, 26 July 2015.